The shift to Audi Field was always going to bring change from RFK Stadium, but some fans are worried about stadium design, tailgate and ticketing issues heading into Saturday's opening game. 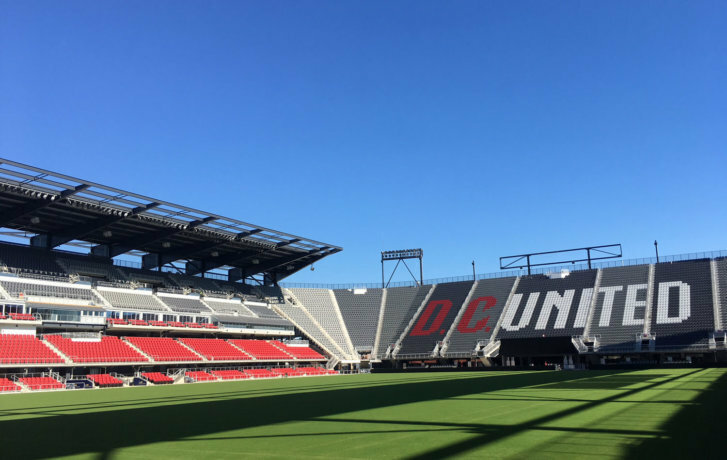 WASHINGTON — D.C. United has plenty to celebrate this weekend as it opens its flashy new stadium, Audi Field, and expects its newly acquired star player to take the field for the first time. But not everyone is as excited for the opening of the new venue as one might expect. Tailgating, ticketing and stadium safety concerns have left some of the team’s biggest fans apathetic and others ready to protest. Wayne Rooney, England’s all-time leading goal scorer and one of the most recognizable names in soccer, officially joined the team last week. But after years of bottom-dwelling and a front office unwilling to spend for bigger talent, some fans say it isn’t enough. Even with a backloaded home schedule giving them anywhere between four and six more games left than the rest of the Eastern Conference, United sits in dead last, five points back of the next closest club and 13 points out of a playoff spot. They’ve won just two of their first 14 games. The opportunity to make a run is there, but we’ve yet to see if the talent can take advantage. There is also the matter of the tailgate, the heart and soul of the fan experience. While the team is opening a new fan plaza with a beer garden, games and food trucks, there will be no large, communal space available like there was at Lot 8 at RFK Stadium for all fans to convene. With a significantly different geographical layout, there really isn’t a logical space. The closest open space is likely the Bardo Brewery, just on the other side of South Capitol Street, but it has recently lost a chunk of its capacity due to the construction on the Frederick Douglass Memorial Bridge. Even so, the brewery says it has not been approached by the team or supporters’ groups. Lambert said the Screaming Eagles started looking for a tailgate spot six months ago, eventually entering into a partnership with Earth Conservation Corps on Half Street SW, along the Anacostia River. There’s both indoor and outdoor space with roof decks, as well as a small green space out front, which can accommodate maybe a few hundred fans, well short of the roughly 1,200 or so total membership of Screaming Eagles, not to mention nearly another 2,000 from other supporters’ groups. “There was always a question looking ahead, even years out, knowing where Audi Field is and how tight it is in that neighborhood,” said Charlie Boehm, a local journalist who has covered the team for 15 years. Audi Field also lacks the huge, easily accessible parking lots of RFK. Privately, a D.C. public official expressed great concern about the transportation issues the new stadium creates. The team’s website says there are 6,500 spots nearby, but offers no specifics of what that means. The three listed lots on the Capitol Riverfront website are tiny lots at Half & R streets SW and Potomac Avenue SW and South Capitol Street, as well as a lot of a few hundred spaces at 1880 2nd St. SW. The biggest lots will be at Nationals Park, more than a half-mile from the stadium. The city official’s primary focus has been to encourage fans to arrive by any means possible other than driving. There are bike valets on gamedays, as well as secure bike parking on the southwest corner of the stadium. The D.C. United website lists Navy Yard as the closest Metro Station, at less than a 10-minute walk. But it took this reporter, who is able-bodied and walks quickly, 12 minutes to go from the ticket office on the near corner of the field to the gates at the Metro entrance. Google Maps measures the distance at 0.7 miles, or a 14-minute walk. While the team didn’t quite hit its ambitious, original completion date of June, the turnaround time to get the new stadium open was still impressively quick, just 502 days after breaking ground. That’s more than 100 days faster than the comparably-sized Banc of California Stadium opened in April. But concerns have been expressed about the rushed nature of the project. As DCist reported in June, the design change that omitted the fully enclosed roof included in the original plans has led to the sun pointing directly into stadium cameras as it sets. This has already forced the start time of a handful of night games, back to 8 p.m., including Saturday’s opener. But Carrick Baugh, of the District Ultras supporters’ group, says his group raised what it considers the most pressing design issue to the front office — a lack of safe standing space in the north-end of the stadium where official supporters’ groups are allocated tickets. The north end is a steeply pitched area designated for supporters’ groups, fans who often stand throughout the game. That has led recent stadiums, including Orlando City Stadium (2017) and the under-construction Allianz Field in Minnesota (2019), to make these areas standing only, with safety railings for support throughout the section. In a 2016 article on the league website, Minnesota United President Nick Rogers said there was “no reason not to” include the safe standing zone in the design. “Our supporters stand the whole time; they really have no use for seats,” he said. A member of another supporters’ group, La Barra Brava, even contacted the D.C. permit office about the lack of safety railings when the stadium design was first released, but it’s unclear if the concern was ever brought to city officials. WTOP reached out multiple times to Major League Soccer to ask whether or not it discussed the safe standing issue with the team in the construction of Audi Field, but the league did not respond. D.C. United and two of its three supporters’ groups have been at odds since Feb. 14 when, after months without communicating regarding ticketing, the team announced a strategic partnership with only the Screaming Eagles, directing them to manage all aspects of the supporter culture, from ticketing to activities and in-game experiences. That left La Barra Brava and District Ultras feeling disrespected, like they were being pushed out of the new venue. Five months later, the wounds are still open, both sides charging that the other isn’t telling the truth about what was or wasn’t offered. Now, instead of bringing their passion and energy to cheer for the team Saturday, the groups are instead planning a protest march outside the stadium before kickoff. At Monday’s ribbon-cutting, there were also clearly unfinished components of the construction. A collection of late-night work permits posted to the windows along the building’s southwest corner show the last-minute push to finish, but much of the fan plaza out front, as well as the retail space in back, was still under construction, entire sections of both 1st Street SW and 2nd Street SW still closed to traffic. It’s unclear if any component will be incomplete or still under construction come Saturday. The team declined to comment whether that would be the case or how it might impact fans attending the match. The same DCist article that detailed the sun issue also included the recent departure of three top-level team executives, raising concerns among industry veterans heading into such a major event as a new stadium opening. It’s unclear whether these myriad issues stem from an overworked front office unequipped to put out the many fires that a project of this scope inherently sparks. But this much is obvious: The opening of Audi Field Saturday is not the end of the story.